Spooky-J spearheads Blip Discs darkest, most outlandish and hands-on dispatch to date. The A side, "Limbo Yam" contains mystic, glacial and meditative sounds sparsely constructed within a minimalist framework. Both melody and rhythm on this outing working in tandem to create something quite hypnotic and encompassing. "Pfer" on the flip showcases some real production finesse: that tribal, half-tempo D'n'B sound that's incredibly in vogue right now but so hard to pull of with this much style! 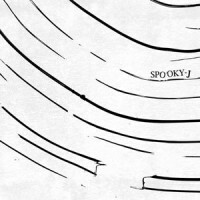 Spooky-J's percussion programming is second to none, while is deft, suave sonics should turn the head of even the most stubborn of nightclub bores. It's another storming release from the buy-on-sight Blip Discs and a wonderful introduction to this obviously highly talented new producer. TIP! Matt says: The exquisite Blip Discs return with the new sound! Half-tempo, 150bpm tribal business... perfect!